Top with Avocado slices, rocket, sesame seeds, sliced onion, radishes, tahini and olive oil. Vegans and Vegetarians tend to struggle once they make such a transition from meat because they find it challenging to think of a protein alternative. However, these falafels are filled with tons of protein, healthy fats and are low carb to make your jaws drop and tummy’s grumble! 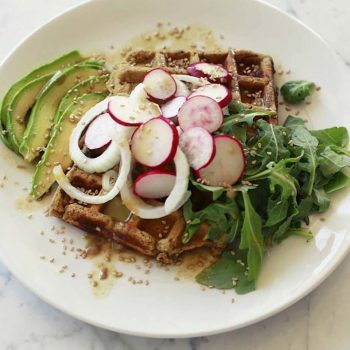 Start by heating up your waffle machine and grease with a bit of coconut oil if a nonstick. Then transfer everything but the raisons, almond meal and water to a food processor or blender and process until almost smooth. Lastly, add the almond meal and raisons whilst slowly and gradually adding the water until you get a paste like consistency. Place mixture over the waffle machine and let it cook for about 5 minutes. Do not touch until it is fully cooked as it will not hold together. Once cooked, let it cool before taking it off the waffle machine so that it can dry up from any moisture and apply to a plate with toppings of your choice!